Vanilla ice cream sandwiches are the secret ingredient in this Chocolate-Peanut Butter Ice Cream Sandwich Cake. 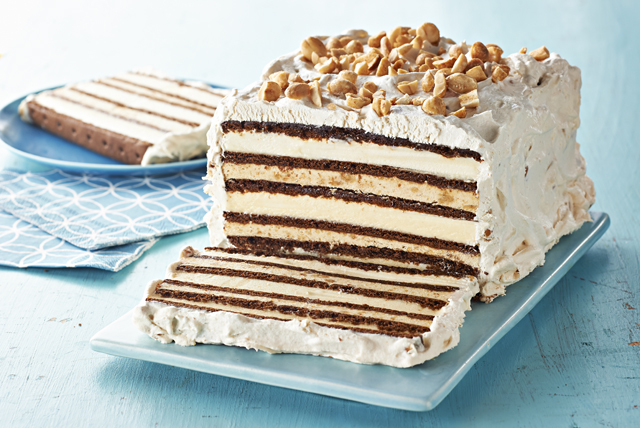 Turn your favourite ice cream sandwich bars into a party-perfect ice cream cake. No oven needed, and no baking skills required. Whisk 1/2 cup peanut butter and milk in medium bowl until blended. Add dry pudding mix; beat 2 min. Stir in 1 cup Cool Whip. Arrange 4 (unwrapped) ice cream sandwiches, side by side, on 24-inch long sheet of foil; cover with half the pudding mixture. Repeat layers. Top with remaining ice cream sandwiches. Mix remaining peanut butter and Cool Whip until blended; spread onto top and sides of dessert. Wrap foil loosely around dessert. Freeze 4 hours or until firm. Top with nuts before serving. Remove cake from freezer about 10 min. before serving. Let stand at room temperature until slightly softened before slicing to serve.